Tanya over at The Other Side of the Road put up a great post today - Prime Purchases - some of the items she's recently ordered online either through Amazon or other retailers - so I thought I'd put up my online purchases so far this month to see if there's anything you might enjoy. 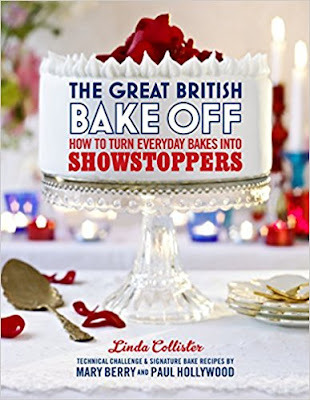 As you know, I am addicted to The Great British Bake Off and I am collecting the cookbooks from the show. This is the book from UK Series 3 which is not yet available on Netflix or DVD. I'm not sure why PBS renumbered the episodes - PBS Season 1 is UK Series 5, PBS 2 is UK 4, PBS 3 is UK 6, and PBS 4 is UK 7. The Bake Off is now in Series 8 although that series was the first one after the move from BBC to Channel 4 so who knows what that will do to the numbering! The book had been sitting in my cart at Amazon for a while and when I saw that the price had a sizable reduction, I snapped it up right away. Vic and I bought a beautiful piece of fabric from Joann's when we lived in Washington. Vic made a wooden bench and the fabric was used to cover a cushion to go on the bench. It's a great place to sit to put on your shoes. As I've mentioned in my weekly updates, he's in the process of refinishing and reupholstering a loveseat one of our neighbors tossed and we decided it would look perfect covered in the same fabric. We searched every Joann store in our area but no luck, the fabric appeared to be no longer available. I searched their site online with no success but somehow, Vic used different search parameters and there it was - Novera Navy. We bought enough to cover the loveseat and for a few more projects. My only other online purchase this month was my order from Melaleuca and it was a pretty standard stock up stash of household and toiletry items - dishwashing liquid, stain remover, body wash, soap, deodorant, and refills for the plug in scented oil warmers. I love the convenience of sitting down on the 1st of the month, placing my order, and having it arrive in the mail a few days later. What a fun post! Be sure to take a photo of the loveseat when it's completed. I don't really do much online shopping. Occasionally books or DVDs from Amazon. Rarely cross stitch items from 123stitch. My husband buys pickles from Walmart online. At least he did, now they don't seem to have his brand any more. Oh well. I always love reading these posts! Great British Baking is such a fun show. Also, thanks for the link in previous post to What Kate Wore. I had never heard of that website. Lots of great info found there!